Today, the world faces the highest displacement of people on record. Over 65 million people are forcibly displaced; 22.5 million of those are refugees, with only 189,300 resettled. This is a global crisis – ongoing and evolving – with a local and global reach – and constantly changing. Though many artists, curators, and designers are attempting to address this predicament, this project asks how can the place(less)ness of an exhibition and online platform properly present or engage with the experience of displacement? A refugee, as defined by UNHCR, is considered someone forced to flee their nation due to persecution, war, or violence and unable to return home. But establishing a new home can be a tenuous prospect. When permanence and stability are both compromised, what does place mean? How does one present and represent the built environment of a displaced person? Some of these questions have been explored in architecture and design exhibitions, like MoMA’s ‘Insecurities: Tracing Displacement and Shelter’, which addressed architecture for refugees, but not by refugees. Removing refugees from these representations frees an institution from acknowledging its privileged position, clinical lens, or exploitative perspective. But embodying a distanced vantage point is problematic, particularly when it involves people with limited agency. This project – as an exhibition and online platform in one – seeks to bridge the architectural and social by re-inserting the refugee as well as their experience of place into conversations about migration and dislocation. The question of place is particularly complicated by the permanence of these ‘impermanent’ camps, as well as the refugees’ liminal status in the camps and beyond. Provided with a social media platform, refugees are asked to explore issues of place, home, and belonging. They respond by sharing, in multivalent forms of self-representation and self-curation, their relationship to public and private space. As “curators,” we collate their content into multi-sited exhibitions. Along with this content, we present architecture by refugees, showcasing their reclamation and expression of place. Our project challenges viewers and the host institutions to question what it means to exhibit an architecture of dislocation, when the very act of exhibiting architecture is a dislocating act. In situating these dislocated spaces through the refugee’s individual voice/lens, this project grounds itself in both the isolated and yet roaming space of the gallery and its online form. Through the use of social media, our project broadens the conventional architectural exhibition – in its format, its content procurement, and its audience. Here, social media humanizes and gives agency to these displaced people and extends the boundaries of social space. It also imagines contemporary and accessible ways of representing and presenting place. Our project includes two components: an exhibition and a social media platform. While many exhibitions include projects by architects, artists, and designers for refugees, our exhibition will showcase architecture and design interventions by refugees. While no means comprehensive, the exhibition attempts to highlight the broad geographic range and scope of such interventions and in so doing, contextualizes the personal experiences of refugees as they represent themselves in the social media component below. Some examples to be exhibited include the refugee-conceived-and-built Jungle Camp in Calais, France, which included shelter, places of worship, a community center, and schools; a refugee-owned building supplies shop for DIY construction in Camp Domiz in Iraq; and ways that refugees have appropriated and personalized their residences throughout the world. In presenting architecture by refugees, the exhibition will frame the project among larger ethical questions of refugee architecture and its exhibiting. While every refugee and refugee settlement is unique, fundamental questions about agency underlie most interventions: Are refugee settlements born out of humanitarianism or security as a means to limit their passage? How relevant are architectural interventions by Architects? Should Architects be involved at all? Does their involvement make them complicit in what some view as an architecture of detention? And furthermore, what are the limitations of an exhibition as a space for representing displacement? Through international agencies, a select group of refugees in the Jungle and Domiz camps, as well as in major cities for refugee resettlement, will be loaned phones to record photos, videos, and audio in response to the prompt: what does home and place mean to you? 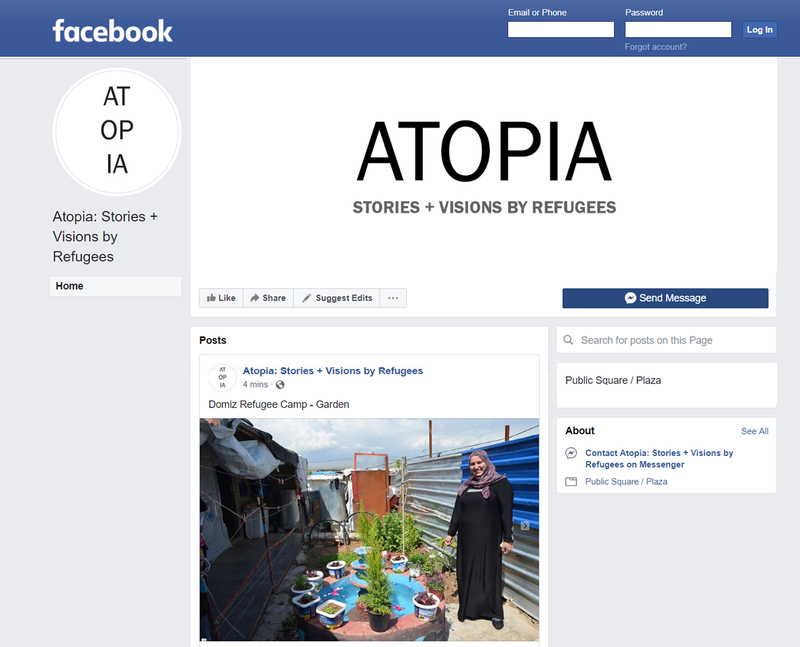 Participants will upload their content to the Facebook group – ATOPIA – with geotags. They will be encouraged to record their stories, memories, and observations as it relates to the spaces they capture, with possible incentives including honoraria or course credit. While this content will be minimally edited by the “curators” – including translations into English, if applicable – the use of social media grants agency to the participants in representing their stories. And the social media account will offer a ready-made archive, accessible to anyone with an account and an internet connection. This platform raises other critical questions concerning the agency of the curators and the curated. What are the potentials and limits of social media as a means of self-curation? In addition to its online existence, the content will be projected in a gallery as well as other public sites, such as refugee centers or public plazas. Using the touring exhibition model, this project further dislocates the exhibition in its placeness. These stories can then be shared ‘outside’ or in a place accessible to the general public. In doing so, this project indirectly addresses ontological questions of exhibiting an architecture of dislocation in light of conventional curatorial practices within a gallery. Gigliotti, Roberto. “Displayed Spaces” Displayed Space: New Means of Architecture Presentation Through Exhibitions. ed. by Roberto Gigliotti (Spector Books, Leipzig, Germany 2015) 13.